FROM THE COLLECTION: NATURE GONE WILD… ON POSTERS? As the images of Kurja Polt festival flood the screen of the Slovenian Cinematheque for the fifth year, we have another opportunity to air out our abundant collection of film posters and select the ones we believe are worth your attention. This year’s retrospective Nature Gone Wild has enabled us to identify a broad selection of possible candidates, despite the fact that only one poster representing a film from the programme selection can be found in our collection. 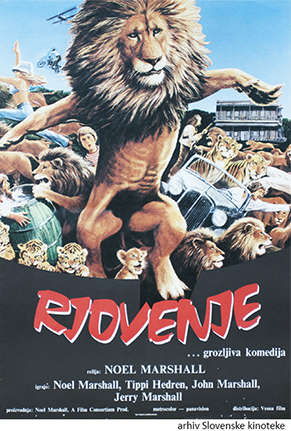 How fortunate we are that it is precisely the poster for Noel Marshall’s 1981 Roar, and how even more fortunate that it is such a bizarre one! Quite in the spirit of Kurja Polt festival. We immediately decided that this was to be the central image of our exhibition. After narrowing down the selection, we divided the posters into two groups. The first includes works in which nature is either presented as a menacing adversary to mankind or represents the “wild nature” that lurks within human beings themselves. The second group features creatures that, in countless original ways, pose a threat to the film’s characters who were unlucky enough to cross their paths. Like every year, our exhibition also includes posters that will never be found on the world’s greatest list and those that we otherwise never get to showcase. But under the wings of Kurja Polt festival it is precisely these outsiders, misfits, weirdoes and renegades who find a welcoming embrace.